When severe flooding hit parts of Thailand, people suffered. In Krabi province, a woman named Lirapan Junjamsiri thinks she may have stumbled on luck. The flood brought a baby softshell turtle which was of an unusual gold color into her backyard. Because of its auspicious golden color he lady has kept the turtle in a bucket since she found it on 07 January, and has been feeding it water spinach. She believes that the turtle will bring her luck, and she is not alone. Many people from the village have come to rub the turtle’s belly with powder hoping numbers would be revealed. 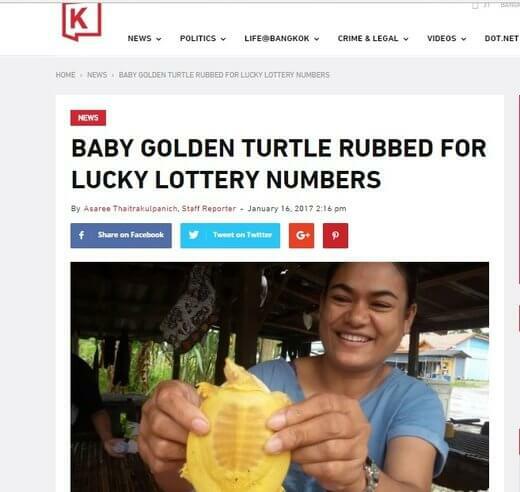 They are hoping the turtle can give them lucky numbers for the lottery. So far no one has been lucky yet. But the woman and the village keep hoping that sooner or later the turtle will invite lady luck to visit. At least the turtle did not end up in a soup pot!